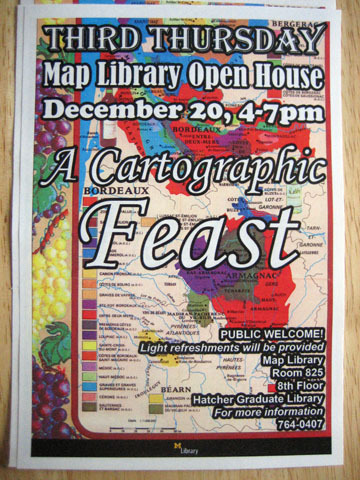 So Karl Longstreth and the crew at the University of Michigan’s Map Library take the third Thursday of the month to show off their collection, and December 2007’s exhibit was all food maps! There were dozens of maps, from local to international and from awesome to ridiculous. I hesitate to say which I liked best; there was a stunning series of Italian regional maps. 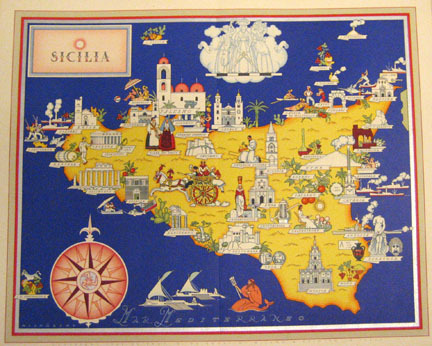 Have a look at the color in this map of Sicily! Also, check out the citrus inland and seafood around the coast. 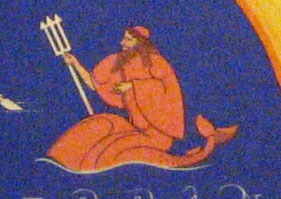 My favorite is what I’ll call trident toting cardinal mermaid (no, merman, merman!) off the southern coast. I feel like that fellow is probably some mythical symbol of whom I know nothing, but regardless, I like the cut of his jib. There were wine maps and cheese maps and agriculture maps and demersal maps (kinda like this crazy demersal fish map from NASA!?!) The maps of these sea floor-hugging fish caught my eye since I’ve been reading Mark Kurlansky’s Cod. I even made the current header for this blog from an image from this exhibit, a map of Agricultural Regions of the United States. And a real standout among all the maps from A Cartographic Feast was the Google Maps printout Karl made that shows a major drawback of living in this part of the country, the hundreds and hundreds of miles between us and the nearest In-N-Out Burger. This entry was posted in Uncategorized on January 9, 2008 by Jason.